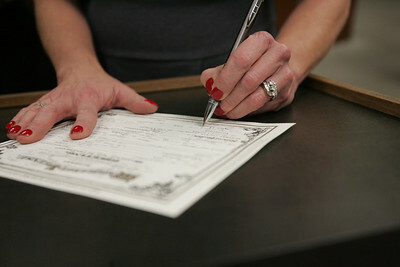 Monica Maschak - mmaschak@shawmedia.com Julie Alomia signs a marriage certificate after a ceremony where a judge married her to her fiance Carl Marley at the McHenry County Court House on Wednesday, December 12, 2012. Alomia believes in fate and liked the idea that the repetitive date won't happen again in their lifetime. Monica Maschak - mmaschak@shawmedia.com Carl Marley leans into his bride Julie after slipping the wedding ring on her finger at their marriage ceremony on Wednesday, December 12, 2012. 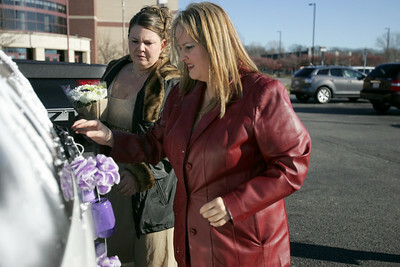 Monica Maschak - mmaschak@shawmedia.com Bride Trisha Brock (left) helps her friend Roxanne Diaz hang wedding car cans to the back of the newlywed's car after Brock married her groom Jesus Deleno at the McHenry County Court House on Wednesday, December 12, 2012. 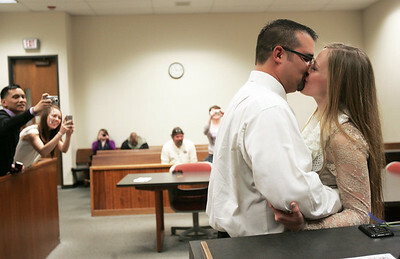 Bride Trisha Brock (left) helps her friend Roxanne Diaz hang wedding car cans to the back of the newlywed's car after Brock married her groom Jesus Deleno at the McHenry County Court House on Wednesday, December 12, 2012.